What Is DA Form 2062? 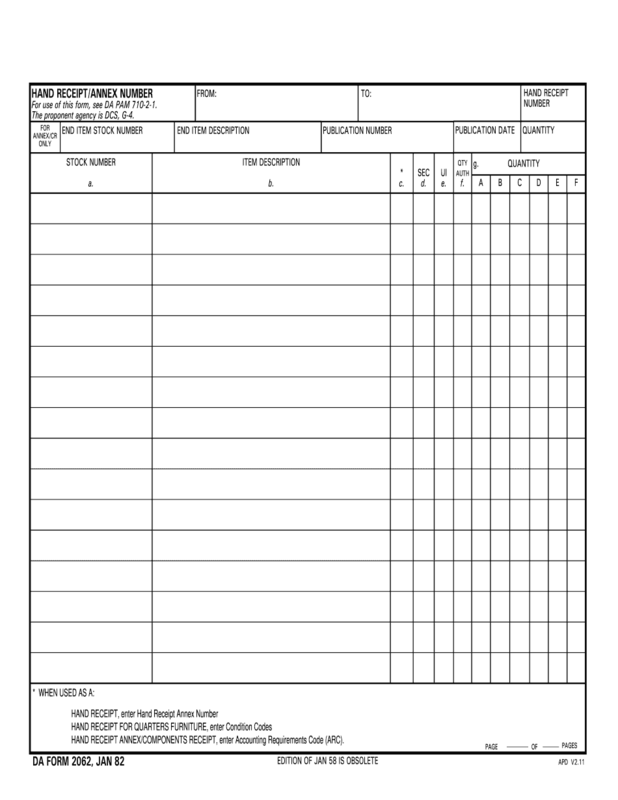 DA Form 2062, usually known as a Hand Receipt is a document for the needs of the US Army Forces. It is necessary while keeping track of army property. An individual responsible for this matter should download the form and fill it out properly. He or she should list non-expendable items that are assigned to units and individuals. Filling out the DA-2062 depends on its use. However, it usually has almost the same header for different purposes. It is intended for identifying the person or unit that provides the property and the person and unit that receives it. It is necessary to enter in a certain box item’s stock number. There are fields to describe an item, indicate the publication number and date. Specify the quantity of the transferred items at the final box of this field. After that it is required to indicate one item for each field. Boxes A and B are for the stock number and the description. Box C is intended to highlight a type of purpose for which this form is created. It is filled out with the Hand Receipt Annex Number. In case a person would use it for Quarters Furniture, he or she should enter the details connected with the condition of the furniture. After the document is finished, it must be signed by both parties. It is also advised to print it and keep copies. © 2019 da-2062-form.com. All rights reserved.